An MIT graduate student proposes covering Earth bound asteroids with paint using paint pellets and paint balls to deflect its trajectory from hitting our planet. The Earth has always been in danger of being hit by large space objects such as comets and asteroids. The extinction of the dinosaurs 65 million years ago, is said to have been caused by an asteroid ten to fifteen kilometers wide hitting the Earth. According to Nick Bostrom who did a study on human extinction scenarios and its related hazards, every 500,000 years, an asteroid 1km in diameter strikes the earth and a 5km asteroid every ten million years. To get an idea on how powerful asteroids of this size are, a five to ten meter asteroid packs as much power as an atomic bomb. 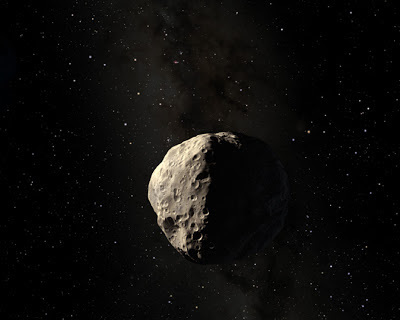 Asteroid 2004 MN4 known as Apophis has a diameter of 270 meters and weighs around 27 gigatons. One gigaton is one billion tons (1x109). According to its present trajectory, Apophis will have a close call with the Earth on Friday, 13 April 2029. The asteroid will be so close that it will be passing below the communications satellites orbiting the Earth. Apophis will fly past the Earth just 18,600 miles above it. Earth satellites orbit at 22,300 miles. Apophis has been a growing concern with scientists. They have been thinking of ways to try and avert the disaster this early in time. China's Tsinghua University proposed launching a solar sail powered spacecraft that will move the asteroid away from the keyhole. Some propose landing a probe that will land on the asteroid and push it away using an ion engine. The European Space Agency is looking at launching a projectile or spacecraft to collide with it, hopefully changing its' direction. Sung Wook Paek, a graduate student in MIT’s Department of Aeronautics and Astronautics won the competition with his novel and original idea; paint the asteroid white. According to Paek, two rounds of pellets filled with paint powder will be shot at the asteroid. Around five tons of paint would be needed to cover the front and back of the asteroid. The paint will increase the asteroid's reflectivity or albedo by more than twice its usual. The initial force from the pellets would bump an asteroid off course; over time, the sun’s photons would deflect the asteroid even more. As the pellets hit the asteroid’s surface, they would burst apart, splattering the space rock with a fine, five-micrometer-layer of paint. The effect is not instantaneous. It will take around 20 years before the full effect of solar radiation pressure to kick in and successfully pull the asteroid off its trajectory.